Advanced Elements Advanced Frame Inflatable Kayak is an awesome alternative for those who dont want to transport a hard kayak. I actually have two of these, one of them is at least 7 years old and I loved it so much, I recently purchased a second one so I could bring someone along. I have had this kayak in less than ideal ocean conditions and never once felt unsafe. I have also inadvertantly but more importantly kayak surfed with this baby on the North Shore of Hawaii, this is an incredible kayak, highly recommended! I also recommend grabbing the backpack AE makes for this kayak as it makes travel that much easier. SAdly enough, this kayak has also been packed away covered in sand and still came out unscathed. Despite sometimes rough seas in both the Atlantic and Pacific and the less than ideal conditions my teenagers have stored it in, this inflatable is a great investment for any paddler! We recently purchased a sail to hook to this kayak and now we are trying out kayak sailing. Bravo AE for this versatile watercraft! Advanced Elements AdvancedFrame Inflatable Kayak Colorado resident, female over 60 Approx 5'5" 125#. Have taken this out 4 times in last 2 weeks. Last time was on Lake Dillon, CO This is the 1st lake with power boats. Felt stable, but would purchase water bailing system if around power boats in any kayak, hard or inflatable. Very happy with purchase. I had borrowed earlier model on lake several times, as I really didn't think I would like inflatable. This model tracks better and has better lumbar support. Still messing with seat adjustments, mostly because foot area OK for me as setup now, but not super roomy. Got it for my daughter and she loves it. Very sturdy, well made and easy to inflate deflate. Excellent Kayak. Feels very much like a hard shell. Great handling. Opted for this over the Expedition because of weight, length, and rigidity. I'm using it without a backbone, I would think it would be indistinguishable from hard shells with one. Inflates in about 2 minutes and deflates and folds in 1. I usually wipe mine with a towel after use so it takes a couple of minutes. Get the double (not single) action pump. Foldability is priceless! The only two issues are: Storage capacity is limited, but that's expected. The other is a tendency to skew to the right. This can be compensated for by skipping a left paddle every now and then. Austin Kayaks has the best price on the net. SHipping was very fast too (less than 5 days). 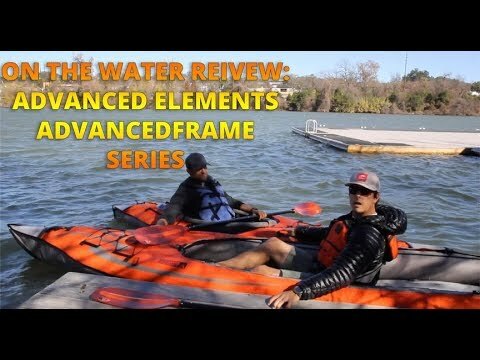 The Advanced Elements Advanced Frame Kayak and AF1 Backbone are a must for any kayaker. So easy to deploy, so easy to transport, so very robust, extremely well made. What a treat! Definitely get the backbone as it's this feature which makes the kayak a non-compromise (without it the kayak will "taco"). Otherwise no complaints at all. Great for fishing or just paddling around. I recommend this model for anybody >100lb and <230lbs. My 115lb girlfriend is able to carry hers which is extremely good for when she's solo. Under 6'2" is best. I'm 6' and have no trouble fitting so longs as my shoes are off, have about 2" of space between my feet and the front tube. Great kayak. My wife and I didn't have enough space in our suite to store hard-shell kayaks and Advanced Elements has served as a great alternative. Able to set up in literally 5 minutes- simple to disassemble and pack up again, extremely durable, able to keep up (or surpass) friends in hard shell kayaks. This has really been an excellent purchase. Awesome kayak! Lightweight, easy to assemble, really nice to paddle. I was concerned to buy an inflatable kayak, but changed my mind on the first time I tried it. Since then, every time I use it someone is asking about it and 2 of my friends bought the similar models. A little bit tight to get in and out (opening the zipper on the deck helps) and foot rest is not the best, but considering the pros and cons, I am really happy with this kayak. It also requires some special treatment during the deflation as you need to dry the kayak to prevent mold formation. Use a water repellent spray on the deck to speed the drying time. For the price, I would expect to get a pump included on the pack. I love this kayak. It's easily portable, very comfortable, tracks well, and inflates in less than 10 minutes. I now own two Advanced Elements, and wouldn't go back to the hard kayaks. This is a great kayak. We bought two different types of inflatables to test, as we planned to have three (one for me, and one for each of my kids). This one was by far superior in every way but weight to the other one we tried, and it is light enough to manage (i'm a small, not particularly strong woman, and my son is 12, and we can both haul this around without issues). We love it. we've taken it out multiple times and enjoyed it every time. AE AF solos are the best! Bought one last year on whim. Now, in my Indian Rocks Beach / Intracoastal condo complex, we have a fleet of seven boats (with others becoming jealous) exactly like mine. They are quick to set up, easy to store and transport, with handy built-ins and easy to accessorize. Get the hand pump for sure; easy, quick, portable and it "pressurizes" the bladders like a 12v can't. After 45 trips, the other day a guy thought mine was new. The double-nylon layer protects the overlapping bladders superbly. Comfortable seating and back like no hard shell. (Use a beach towel on top of the floor for even more comfort.) Small as the skeg is, it works great to keep the boat on track. Love being able to take two of these, with all gear, in the trunk of my small coupe and never have to worry about highway wind or theft. These are seven (so far) happy yakkers who love this boat. I have enjoyed a Stearns Spree II for 4 years...stearns is now out of business and we looked for a long while to find a similar kayak for my husband. He has a hard time getting out of the advanced elements kayak and there is no zipper pouch in front to keep a dry bag as there is in the stearns. The stearns has 3 compartments to blow up..thedvanced elements has 5...a little more complicated and takes longer to pump up. With stearns now out of biz, advanced elements is the logical choice. Have used this for exploring small lakes and for inland marine (Puget Sound). Design and construction are excellent. The coaming is not continuous so there is a leak at front center, even if you use a spray skirt, which is probably why it is not recommended for big water. With the Backbone installed, cruises easily at 2.8 mph and without much of a push to 3.3 mph. The fastest I could get was 4.5 mph and that's putting out quite a bow wake. Storage space is sufficient for overnight travel if you're into ultralight backpacking; I would not hesitate to take this boat on an overnight. 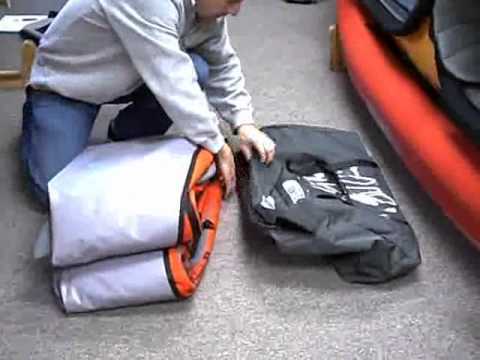 Easy to assemble/inflate and deflate, about 10 mins to fully assembled and about the same to put it back into the bag. Nice boat. Make sure your top criteria is portability. Make sure you get a backbone. Given these 2 things, you won't feel odd or left behind amongst the sleek sea kayaks or SOTs out there. Outstandin Price, Fast FREE shipping, will do buisness again. For Sure! Bought 2 to keep in the RV. Set up and take down was easy. Boats handled well on the windy day we tested them, crosswind, downwind, no problem. The little skeg worked well. They are not, however as efficient as hard shell boats, so expect to paddle shorter distances. Also, there is a high likelihood of getting wet as you exit, as there is nowhere else to push yourself up, except the sides, and I've pushed a side or two under the waterline without realizing it... Until the seat filled with water. these are the best!!! we are new to kayaking and these make it so easy. I have them in the trunk of my subaru legacy at all times and we can kayak any time we want. They are very durable, our first trip was over some pretty shallow rocks and they were awesome. I highly recommend them. The AdvancedFrame Inflatable Kayak are great kayaks, performed very well in the water, and service is great, too. Great little Kayak for youth especially. Had a little problem with one of the valves for the rim. Had to glue it back to the tube. Bought two of these. Service is great. We have two of these kayaks. They are proving to be excellent for the paddling we are doing along the Caribbean coastline of the Dominican Republic. They have performed well in windy conditions, and are a real joy in calm weather. They are very easy to inflate and deflate, are relatively lightweight. They can be stored easily, and transported even easier. No kayak is perfect, but we feel like these are great for what we do. Love the kayak. Easy to assemble. Sturdy kayak. Lightweight. Performed well in the water. I have no complaints. Just took the advanced frame to Alaska for a 150mi. paddle down the Kobuk river. The boat preformed well in fast moving water, and the skeg kept in strait in the slow water. The set-up is easy, and deflation and packing it into the bag is a breeze. The hull material is tough stuff, and after hauling it over rocks, and portaging over a mountian, I could not find a scratch. I am 6' tall, so the entry/exit was a bit tough. The tie-down points in the back were great,and the bungee in the front worked well. Overall, a well-made boat. Very well made inflatable that is easy to set up and take down. It tracks well and gives a sense of stability. The only disappointments are the snugness, especially for the feet and the agility required for smooth entry and exit. 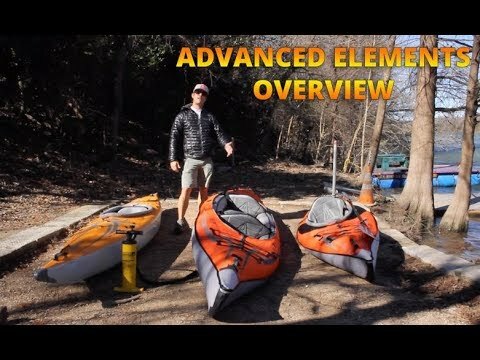 This kayak delivers exactly what Advanced Elements advertises. It is very stable, and surprisingly easy to set up, and take down. The materials feel very durable, so I was not worried my first time out when I felt a large object slide by as I passed through a shallow area. While folding it to put in the back of my vehicle, I could not find a mark on the underside... tough stuff. I can't wait to get it in the water again this weekend. A: The AdvancedFrame is designed to be impact and tear resistant, though we would still recommend exercising caution. Q: Can I use Bravo high pressure BTP 12 volt pump to inflate this? 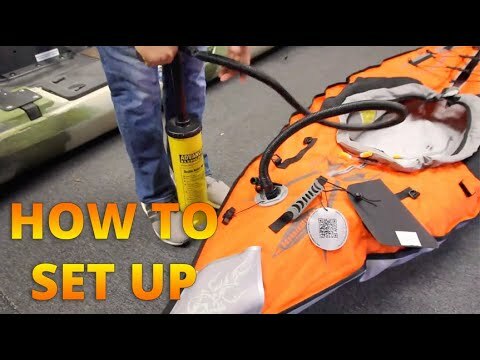 A: Yes, you can use the Bravo pump with this kayak!